Chef Anjum Anand’s icy take on a traditional Indian lemonade is exactly what we want to eat in the heat. 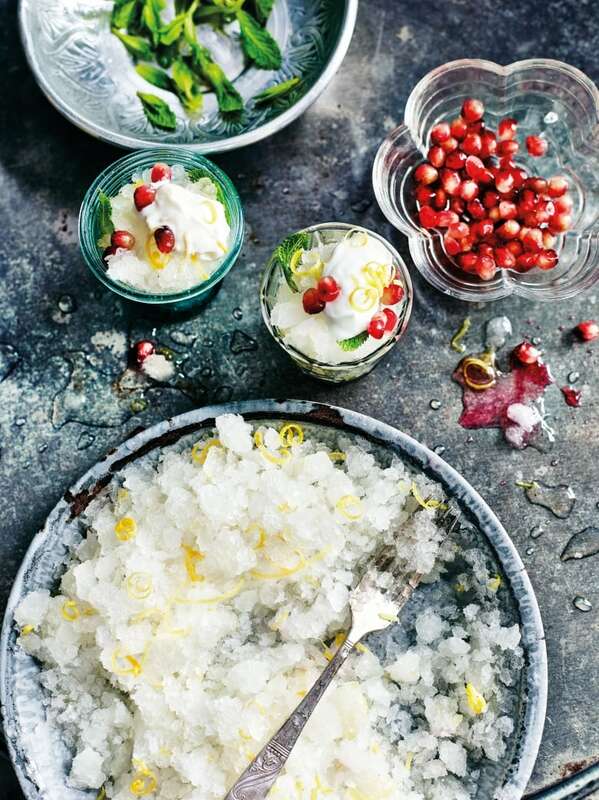 We’ve reached for frozen treats to help us cool off on many steamy days this summer, but when we laid our eyes on this simple granita recipe from chef Anjum Anand’s new cookbook, I Love India, our desires for all other icy desserts melted away. Light and refreshing, this is shaved ice with flavours sophisticated enough to serve after an elegant meal. Read on to hear about Anjum’s inspiration for this dish and get the full recipe. It is true that many Indian desserts can be rich and sweet, but we do have flavoured Indian granitas in the form of gola. These are little cups of shaved ice, flavoured with your choice of sweet syrup. Shikanji is not a typical flavour; it is a popular lemon drink that is sweet, lightly tangy and gently flavoured with roasted cumin, black salt and mint leaves. It is really refreshing and moreish. The reason salt was added was to replenish and rehydrate people who had been too long in the sun; cumin and mint helped to cool the body. If you don’t want to add black salt (which has a sulphurous smell, but not taste), you can add a little pink salt, or no salt at all. This is subtle and delicious and perfect at any time on a hot day. It is always surprising to those who eat it, as it looks so simple, but hides a multitude of subtle flavours. Pour the water and sugar into a small saucepan and heat, stirring, until the sugar has dissolved. Take off the heat, add half the lemon zest, all the juice, the cumin, salt and mint. Allow to infuse as it cools for at least 1 hour. Fish out the mint and pour into a flattish rectangular freezer-proof container, cover with the lid and place on a flat surface in the freezer. Every 45 minutes or so, take it out and break up all the crystals forming on the inside by scraping with a fork, making sure you get the sides as well. Repeat every 45 minutes or so, scraping the granita with the fork so it becomes granular, until it is all frozen. When ready to serve, stir together all the ingredients for the crème fraîche; I like to use the half-fat version to keep the dessert light. Remove the granita from the freezer and scrape it again to break it back up. Spoon into little glass bowls or glasses, scatter over the shredded mint and stir it in with a fork, spoon over a dollop of the cream and sprinkle with the pomegranate seeds and some lemon zest, if you like. Serve immediately. Excerpted from I Love India by Anjum Anand. Photography by Martin Poole. Recipes Copyright © 2017. Excerpted by permission of Quadrille. All rights reserved. Pineapple whip — literally the most chill of all tasty, summertime desserts!